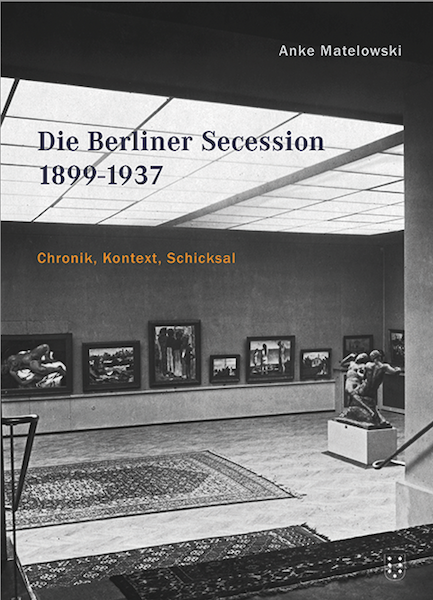 Book out soon: Anke Matelowski, Die Berliner Secession 1899-1937. 24 x 17 cm, ca. 650 Seiten, 400 Abbildungen. As much as the myth adheres to the Berlin Secession of being the birthplace of “Classical Modernism” in Germany, it is, likewise, a relatively little researched subject. As a matter of fact, neither its date of foundation nor its dissolution has been established so far. The best known protagonists of the Berlin Secession were Max Liebermann, Walter Leistikow, Lovis Corinth and Max Slevogt and their merit was to bring Impressionism to Germany in the years heavy with imperial, representational subjects and, thus, to begin a new era for art in Germany. With the dissolution of the Secession in the Spring of 1913, however, the role seemed exhausted after a splendid dozen years. About the time of the Berlin Secession after 1913 little is known. In her study, Anke Matelowski now closes this gap. From largely unknown sources, she has been able to establish the founding history of the Secession as well as the years of the First World War, the Weimar Republic until the time of National Socialism. Great detail is paid to the various aspects of this history: the exhibitions, membership structure, buildings and premises available to the association, its relationship with local authorities and towards official art policies, cooperations with other artists’ associations, strategies for coping with political and economic crises, etc. Matelowski supplements her account with extensive lists, which provide reliable data about members, board members and exhibitions for the first time. Similarly, she provides information about the groupings that split from, competed or co-operated with the Secession. The work sets a new standard for the most important modernist art association in modern Germany.